Cadillac and Mercedes-AMG win again! From the long and wide stretches of Sebring Raceway, the IMSA Weathertech Sportscar Championship motley gang went to the winding streets of Long Beach, California. The shortest race of the season proved to be every bit as exciting as the first two, mixing controversy, drama and some great on-track battles in a space of just 100 minutes between the waving of the first green flag, to the appearance of the white flag. 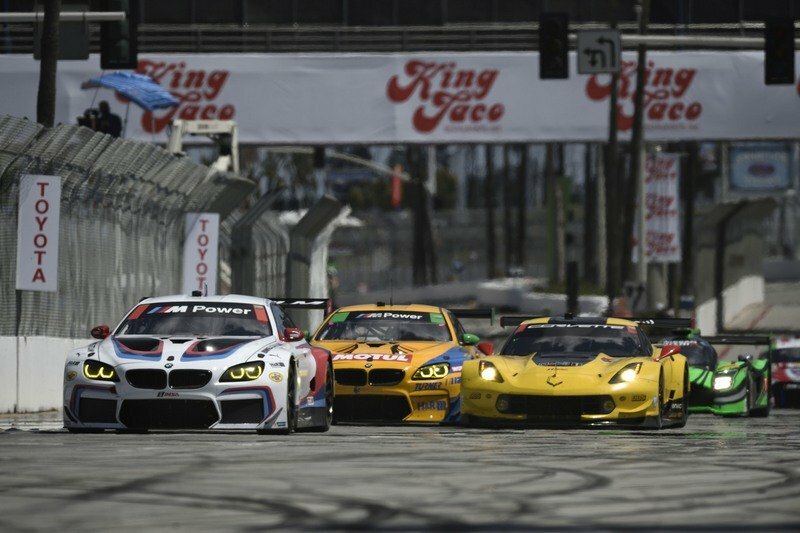 The streets of Long Beach were as packed as ever come the end of last week as teams from a number of series were preparing for the Long Beach Grand Prix. Indycars were on site, as well as the IMSA crews, the Pirelli World Challenge folks and, last but not least, a group of Can-Am cars. These were slated to run for the first time ever at Long Beach in what was a true spectacle for both the eyes and ears. Such cars as the Shadow DN4, the McLaren M8F or the Lola T70 made their way through the 1.9-mile-long street course for a couple of demo races that got everyone in the mood for the races of the modern cars – maybe not as dramatic but surely not forgettable. Ricky Taylor proved to be the quickest in qualifying with his 1:13.549 being a lap record for the Prototype class. 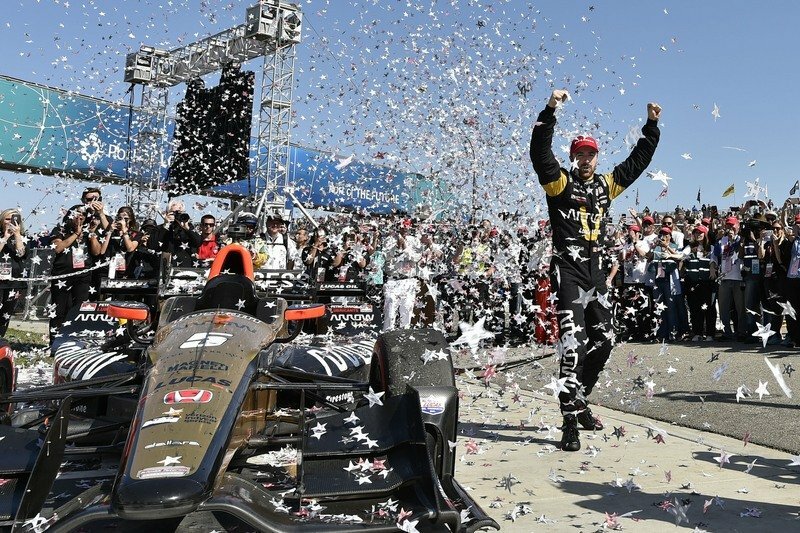 It was also the second podium in the last three editions of the Long Beach Grand Prix for Wayne Taylor Racing’s driver who was 0.2 seconds quicker than Christian Fittipaldi in the No. 10 Action Express Racing Cadillac. Tristan Nunez was third for Speedsource Mazda, but his 1:14.393 was almost a second off the pole time. It was JDC/Miller Motorsport on the fourth spot of the grid while the third Cadillac of Dane Cameron and Eric Curran qualified fifth. One car did not take part in the Prototype qualifying, precisely the No. 90 VisitFlorida.com Racing Riley LMP2 which was crashed in practice by Renger van der Zande, the Dutch going straight into T1 after he lost front brake pressure, the cause of the failure yet unknown. Corvette Racing scored the pole in GT-LM thanks to Jan Magnussen’s 1:16.609 which was less than tenth of a second quicker than Joey Hand’s best lap in the No. 66 Ford. Hand was on an even quicker lap with three minutes left to go when his team-mate, Richard Westbrook, spun and crashed his No. 67 Ford GT which caused a session-ending red flag that denied Hand a chance to get pole. Also denied of a chance was Risi’s Toni Vilander whose starting position, third, could have been better as the Finn was quicker on his last flyer on which he spun out. Fourth was the best that Porsche’s No. 912 could do. The other 991 GTE did not take part in qualifying after Patrick Pilet’s shunt in practice that called for a partial rebuild of the mid-engined car. Bill Auberlen could do no better than fifth for BMW Team Rahal Letterman Lanigan Racing – thus missing out on the chance to score three consecutive poles at Long Beach in three years. GT-D pole went the way of Bryan Sellers and Paul Miller Racing. The Lamborghini driver reeled off a 1:19.243 to beat Jack Hawksworth whose bid for Lexus’ first pole fell short by just 0.033 of a second. Daniel Morad was third for Alegra Motorsport while Corey Lewis put Change Racing’s Huracan on fourth, right ahead of Lawson Aschenbach’s R8 entered by Stevenson Motorsport. 3GT Racing’s other Lexus did not take part in qualifying after Scott Pruett damaged the No. 14 quite badly in a practice crash. With qualifying done, everyone was ready for the race which promised to be more busy than ever as never before had the GT-D cars taken part in the Long Beach round which was, in the past, welcoming only the Prototypes and the GT-LM teams. 34 cars were entered and 33 would take the start on Saturday afternoon. Ricky Taylor made a perfect start aboard the No. 10 Konica Minolta-sponsored Cadillac to lead through the first turn but it was Tristan Nunez who followed him on the way to Turn 2, not Christian Fittipaldi. The No. 5 Cadillac would go on to lose all chances of a good result after clipping the wall with the rear following a weird incident involving the No. 50 Mercedes-Benz in T7. Fittipaldi was about to pass the GT-D car on the outside and seemed to close the corner with the AMG GT GT3 still there and the contact that followed inevitably sent the Brazilian into the wall. The incident prompted a Full Course Caution which meant that Fittipaldi was unable to replace his wing on that lap – being an emergency stop he was only allowed to get new tires. He had to run one more lap without a rear wing before coming back in for a replacement. This lost him and team-mate Joao Barbosa two laps that they never recuperated which meant they finished a lowly 28th overall. Fittipaldi’s crash wasn’t, however, the first of the race. Another Prototype was in trouble just as lap 1 was being completed by leader Ricky Taylor. Toni Vilander, who’d started third in GT-LM, had gotten by both Jan Magnussen and Joey Hand to lead his class. Towards the end of the lap, he tried to pass the Nissan-engined, Patron Tequila-sponsored car of Ed Brown as Hand was putting pressure from behind. Brown, not expecting to be passed by a GT car, turned in without checking his inside and the two cars made contact which sent them into the wall. It was game over for both the Risi No. 62 Ferrari 488 GTE and the No. 22 Nissan-Ligier DPi. The incident also partially blocked Hand and Garcia which shaked up the order in GT-LM. Back to the top of the field, the order was much the same with Taylor in the lead followed by the No. 31 Cadillac, the No. 55 Mazda and the No. 2 Nissan. The LMP2-spec Ligier and ORECA couldn’t match the DPis on pace and were involved in a couple of incidents where their drivers outbraked themselves which lost them chunks of time. Given the length of the race, it was believed that the prototypes had to make two stops while the GTs could go on only one stop. Due to the multiple incidents however, the top runners did manage to pit only once but still found themselves behind GT cars as they exited the pits. This was the point in the race when Ryan Dalziel, wheeling the No. 2 Nissan, got ahead of Jordan Taylor, who’d taken over the No. 10. Extreme Speed Motorsport thus led the P class after Mazda had also had its time at the sharp end. Dalziel managed to make his way through the GT cars – which were all fights for overall position – finally passing the overall-leading BMW with some 40 minutes to go. The victory wasn’t in the cards for ESM because, with just minutes to spare, Jordan Taylor used the slower GT cars to his favor, sneaking past Dalziel before braking for Turn 1 as the two of them went down start/finish straight. Taylor had previously lost the heat coming from Dane Cameron who was running third after the AXR driver hit the wall at the entrence of Turn 5. This gave Mazda the last podium place behind the No. 2 and the No. 10 which managed to win making in three for three in 2017. JDC/Miller’s No. 85 ORECA 07 P2 and PR1/Mathiasen Motorsport’s No. 52 finished fourth and fifth respectively but lacked pace throughout the event, crossing the line just a few seconds ahead of the GT-LM winner. Since I’ve mentioned GT-LM again, I think it’s time to delve into the race in this class which was, at times, quite chaotic. As mentioned, Risi’s Ferrari went from zero, to hero and back to zero in the space of under a lap and that also caused trouble for the chasing No. 66 Ford and No. 4 Corvette. The Ford would go on to suffer a crash at the final hairpin after being tagged into a spin then being collected by another car. The car continued with damage to the front and without the rear spoiler but it was messy. Dirk Muller tried to get going again after the incident but, in the process, blocked the incoming train of cars that included the then second placed Mazda No. 55. The Corvette enjoyed better luck and, after pitting just 12 laps in, found itself within the Top 5 in GT-LM. It was, however, BMW which led via the No. 24 driven by Martin Tomczyk. Team RLL called Tomczyk’s team-mate, John Edwards, in just 30 minutes into the race while under yellow. The smart move promoted the former DTM driver into the lead of not only his class, but the whole pack. He kept himself there all the way until the fifth and final restart with 10 minutes. It’s worth noting that we had seven restarts at Sebring over the course of 12 hours! Things took a disastrous turn for BMW as, just after the restart, Tomczyk’s M6 GTLM started losing power out of the blue and gave away the lead – and possibly the win. The two works C7.Rs benefitted from this incident by moving up to first and second in class. Antonio Garcia led followed by Tommy Milner who made some smart and robust moves past one of the Porsches and the No. 67 Ford to get behind his team-mate. But this wasn’t the last twist of the story at Long Beach. Coming through the final lap, the GT-LM leaders were greeted by a bottle neck in the final chicane caused by a crash between three GT-D cars – the Lexus of Robert Alon, an Acura and the sole Turner BMW. Garcia went for the outside line and Milner for the inside. It was the American’s path which cleared up first and he went on to claim a surprising victory ahead of Ryan Briscoe while Garcia finished down in fifth behind both Kevin Estre and Alexander Sims. After the race, Milner went on to say that he felt more like a chess player than a racing driver, given the way the race had concluded. The aforementioned incident provoked by Robert Alon’s over ambitious dive on the inside that caused the GT-LM debacle did not, however, have a say in the GT-D podium. 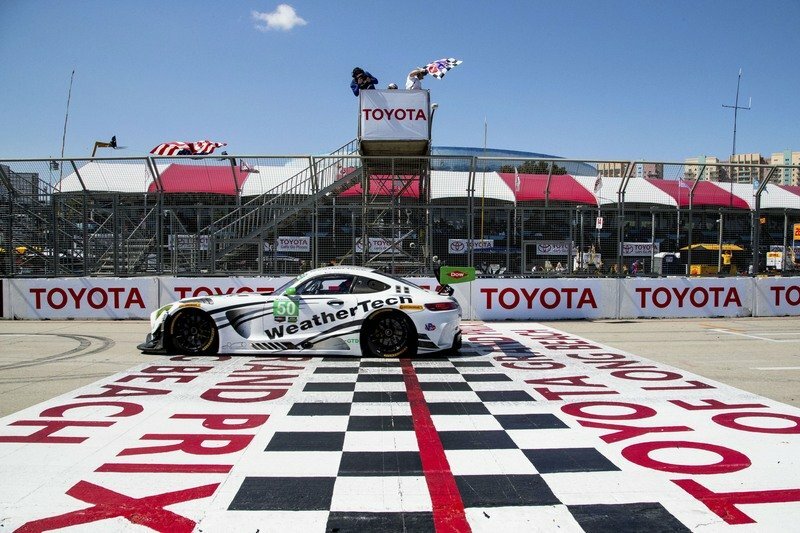 Cooper MacNeil and Gunnar Jeanette won for Weathertech Racing/Riley Motorsports while the sister Mercedes-Benz came home second to sign off a perfect continuation to the team’s historic Sebring win. It was last year’s champions, Nielsen and Balzan, who finished third for Scuderia Corsa ahead of two Porsches – the No. 73 Park Place and the No. 991 TRG entry. Round four of the IMSA WeatherTech Sportscar Championship will take place at the beginning of May at the Circuit Of The Americas in Austin, Texas and it will be the first time when the event be on the same weekend as the North-American WEC round.